If there is one invitation that I have ever worked on, that absolutely stops brides dead in their tracks when they walk into my studio, it's the Port invitation. It's bold and modern, but done in such a classic and sophisticated way, that every single couple fall in love instantly. It's perfect for nearly every wedding - a winter wonderland, a tented sea side gala, or a black tie ballroom reception. The Port invitation is part of the Calligraphy Collection and the modern calligraphy by Charmaine is the show stopper here. We really wanted the calligraphy to stand out, so we chose to print our Port samples in gold and white silk screen on a thick, deep navy paper. 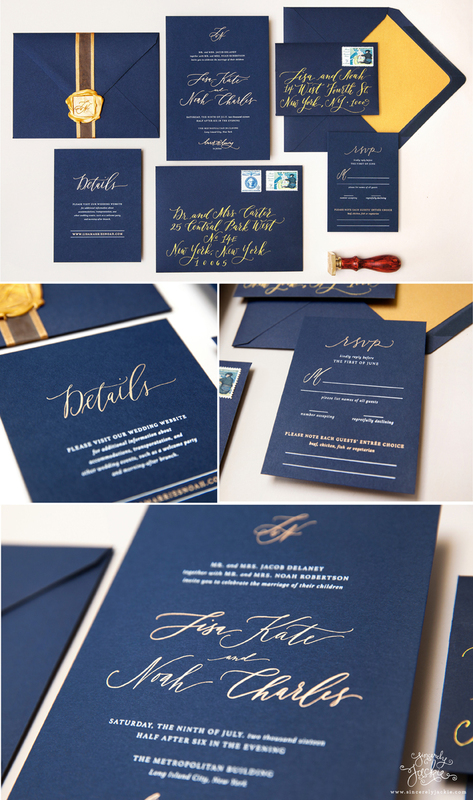 Even though the calligraphy style might be modern, the invitation design is effortlessly classic. A clean monogram, paired with a strong serif font, and traditionally formatted typography makes this design truly special. If you're looking for an invitation that will blow your guests away, Port is it. You can see for yourself by ordering a sample. And if you love the style, but want something softer and brighter, you might love the Port in silver and dusty blue on white paper - which was recently featured on Elizabeth Anne Designs! Thank you for visiting the blog today and letting me share one of my favorite designs with you! I wish you the merriest of holidays and cannot wait to show you so many new designs in the new year!